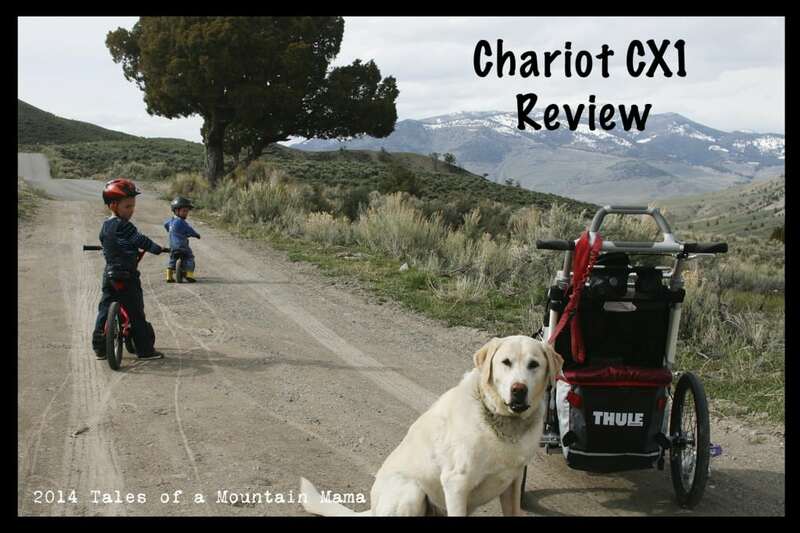 The Chariot CX1 and 2 are the “elite performers” in the Thule Child Transportation Systems line-up for active families. While the Chinook is geared towards a more urban family, the CX is for the more off-road active family with some added bells and whistles compared to the Cougar line. The CX 1 is actually the first Chariot we have used that is not a double. We’ll stick by our claim that even if you have one child, the double provides a welcome addition of space. However, with our configuration of 3 kids that sometimes ALL need to go in Chariots, this works great to have our second stroller be a single. Plus, we can show you what the space looks like in them. We tested the CX 1 running, walking and biking. We will test it skiing this winter and update this review when we do. 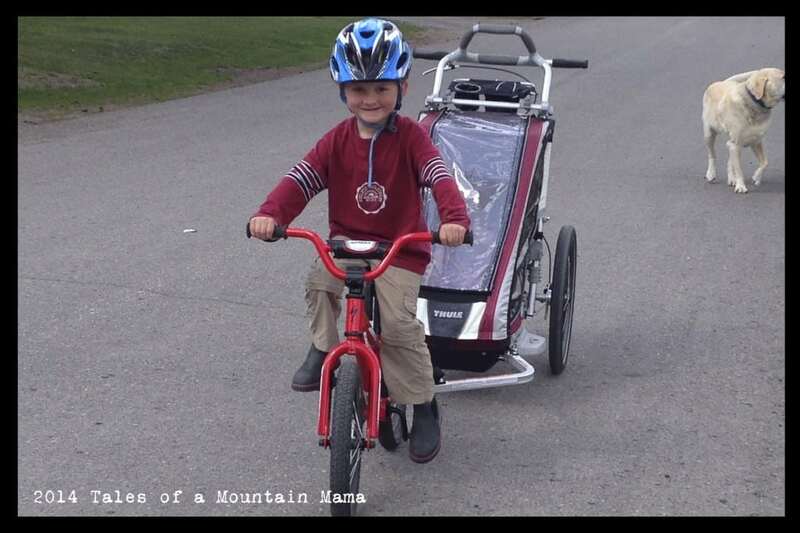 This review will focus mostly on the running/walking aspects, but it’s an incredible bike trailer. We hooked it up to our 5 year olds bike just to see if he could easily pull it, and he had no problem at all (on flat terrain.) It pulls and follows without a glitch and hooks up very easily. In this review we will reference the CX in comparison to the Cougar and the Chinook. Links to both reviews on those models are included at the bottom of this review (right before “Bottom Line”) to help you understand what we mean. 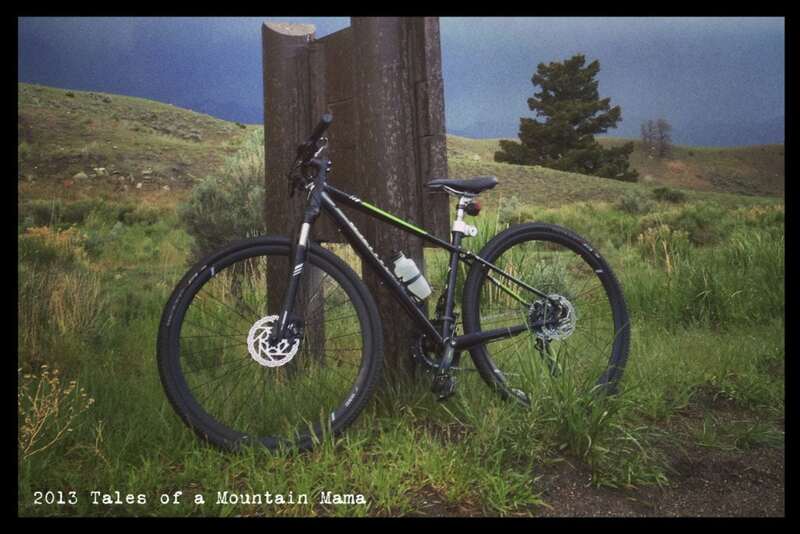 – Handbrake with disc brakes for rough or steep terrain. We use this way more than we thought we would. – It rides like a dream. Really, all Chariots do, but the hand brake linked to the drum brakes on the wheel mean super incredible stopping power. In fact, occasionally, I forget it is so great and will pull the brake and give the rider a little unintentional jolt as it stops quickly. – Adjustable suspension that is adjusted easily means you can give the right amount of suspension for whatever your load may be. 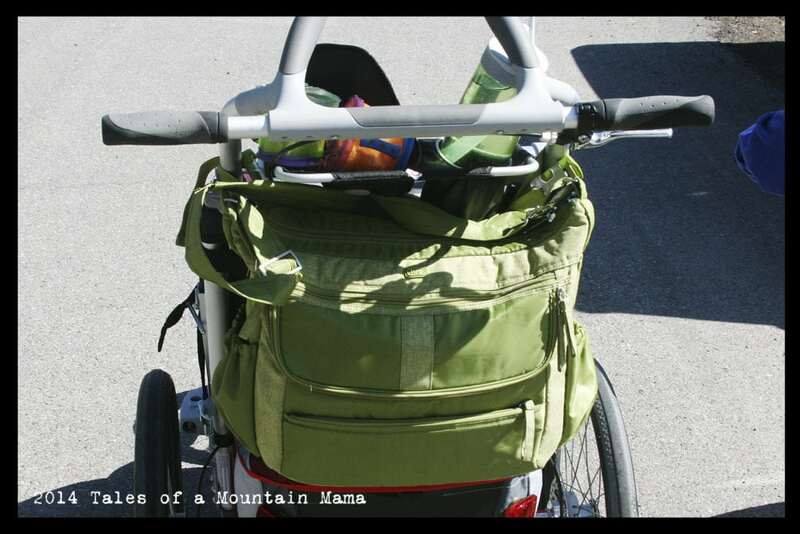 It’s very rare that we only have a 12 pound baby in ours – usually it’s Baby/Kiddo + gear + snacks, etc. – Like the Cougar series, we love the included cargo space in the back. The Chinook comes with a removable bag, but it’s not our favorite. The “trunk” of the CX (and Cougar) holds a ton of extras (balance bikes included) and is very secure. It also can be folded up and out of the way when not in use. – Both side windows can be removed completely to expose mesh. The Cougar does not have this option and it is great for when the weather gets hotter. – Easily changes between bike, stroll, run and ski mode (attachments sold separately except for the included strolling wheels). 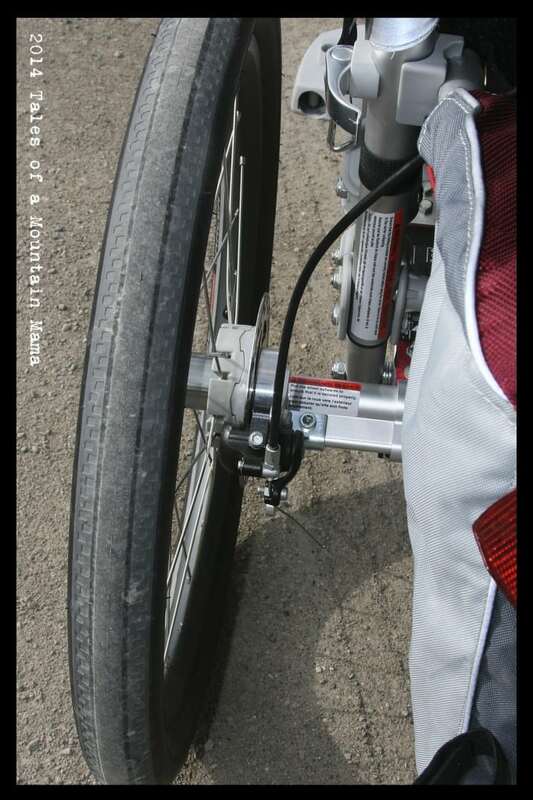 Additionally, when not in use the bike “arm” and strolling wheels can be stored on the Chariot so you have them ready to go. – I love the handle bar on the CX. There are lots of options for holding places on it which is great as you adjust during a run yourself or between pushers. – The Console (sold separately for $39.95) makes stowing an easy-access water bottle and my cell phone and keys in a secure zippered pocket where I can easily reach for them. Also available to add to the handlebar is the Thule Cargo Rack ($79.95) to just hold more gear. Loaded with even extra cargo in the diaper bag. It continues to handle excellently. – There are different levels of shade you can adjust as needed depending on how big your rider is. – You can use the infant-sling ($89.95) in this model, which is our very favorite for taking out teeny tiny (and for us up to 1 year old) babies. – Having the option of the swivel wheel on the front with the jogger would be nice (opposed to switching over to strolling wheels.) However, that is also what makes the Chinook a bit more bulky. Guess it’s a trade-off? 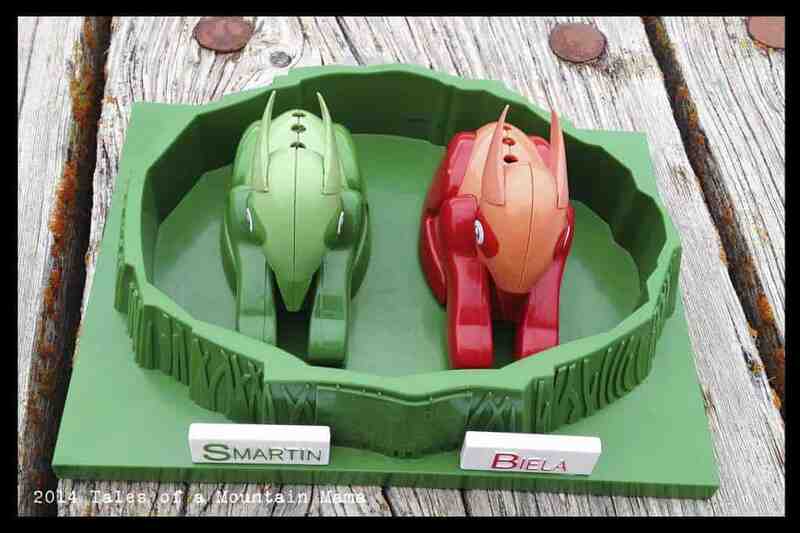 – As mentioned above, the single Chariots (in all models) are tight. They are just big enough for a kid and a few small items. I’d go with the double every time. That said, it sure is nice being able to fit it in smaller spots in the garage. – Because of the hand brake, the handlebar is not easy to remove for storage. You can, but you do need tools (opposed to the Cougar which comes off easily) and have to disconnect the brake. 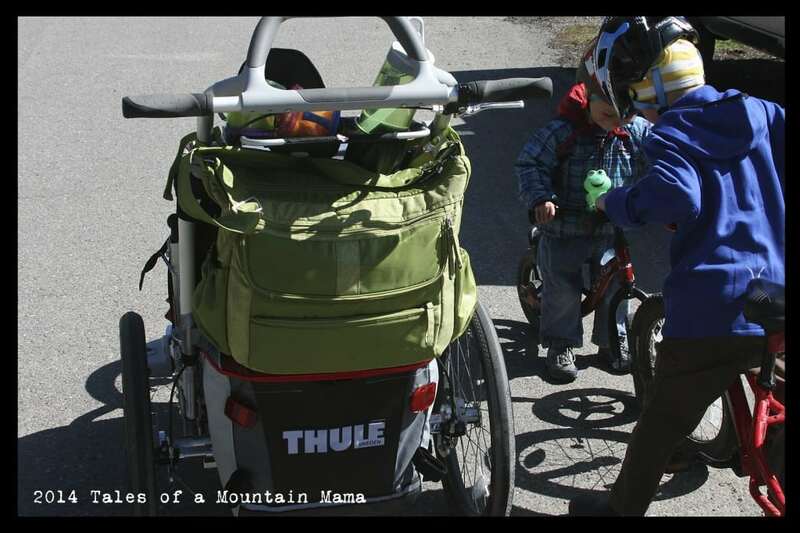 Thule makes incredible Child Transportation Systems – it is what we have depended on to get out as a family since our first child was born 5 years ago. While the cost for the CX is high for just a jogging stroller, it’s well-worth it (in our opinion) for people who intend to use them for their full purpose (run, stroll, hike, ski and bike). If you have questions about the CX series, please feel free to leave them in the comments in this post. We will definitely be happy to answer them! Q– I have just spent some serious time reading your reviews and all of the comments…whew! So I live on a farm in a rural area (some paved roads, lots of dirt roads, no sidewalks) I am a runner (walking when pregnant and after) with two little kiddos & hoping for more. Leaning towards the CX2 for all of the options (bike, hike, etc.) I am 4’11” my kids 2 1/2 and 8mo. Does that sound like the best CTS for us? A– Yes, I think you would. Love the cx2. The only hesitation I would have would be the fact that the handlebar isn’t adjustable. I am 5’2″ and it’s totally ok for me, but something to consider. The Chinook is adjustable. Q– We are trying to decide if we should buy the CX2 or the Chinook 2. What is your feel with regards to the CX vs the Chinook? Our main focus is on the comfort of the kids. Our older one has low muscle tone and tends to slump quiet easily. So we are looking for a seat that gives him good support – especially when he falls asleep. We figure that the Chinook’s reclinable back would come in very handy. A– I think if you are looking for child support in the seat for bigger kids, you would want to go with the Chinook. That reclinable back will be huge for you guys. Q– I read you also have the BOB Sport Utility, is that right? How does it compare to the CX1 and Cougar for running on road and off road? We have a four month old, and would like to run on road and off road, which is why the BOB appealed. But we also want to cycle, so that is why I started looking at the Thule options, as that would cover both activities. Also how good is the suspension on the CX and Cougar for cycling off road?And how useful do you think the handbrake of the CX and BOB is? We do have some hills around here. Q– Were you able to test CX while skiing? Also, can you use the hiking/ski setup to run while pulling vs. pushing? A– CX pulls great while skiing. And I wouldn’t recommend running while pulling it – there’s too much resistance and I think it would get annoying more than anything…. Q– I am having a hard time choosing between trailers for my 6 month old baby. 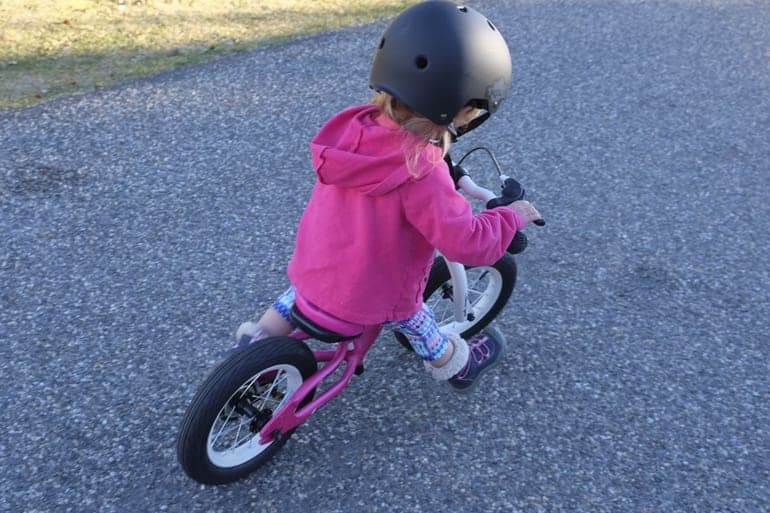 I am a triathlete and would like to be able to do some of my long and short rides outside (both on paved and dirt roads) with the baby in tow in stead of inside on a trainer. I would also use the trailer for occasional commuting and picknicks (on the bike). I have a jogging stroller I really like so I would not use it for running. I was set on buying the CX1 but am hesitant because the seat does not recline and it does not seem comfortable to sleep with your head hanging. Which trailer would you think would be the best option for me out of the ones you have tested? A– Truthfully most of the Chariot trailers pull about the same when biking. We haven’t really noticed much of a difference with any of them. 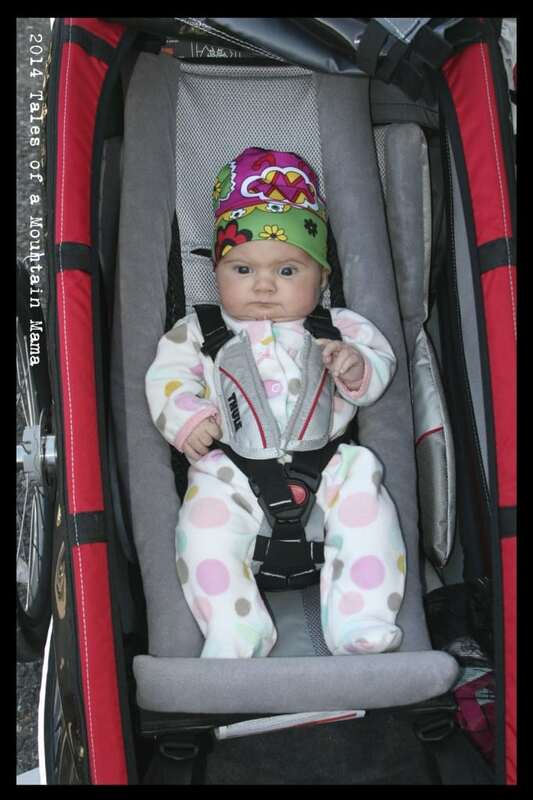 My kids were/are on the small size so we put them in an infant sling until almost age 1 and they were just fine after that (there is a slight reliance in the seats). SO, if you prefer having the reclining seat (which I totally understand), I would go with the Chinook. It has the swivel wheel too, which is really nice for navigating small spaces. 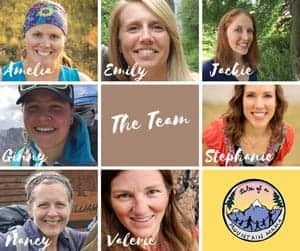 They’re available at REI (affiliate link).